I’m really excited about the guest I have at Dag-Lit Central today. Karen Victoria Smith was one of the very first friends I made when I began my writing and publishing adventure, back in the days when the talk on Twitter was all about writing and drinking and the #pubwrite tag hadn’t been overtaken by spammers. Today Karen is here, talking about her writing and publishing journey, and her new release, Dark Dealings. 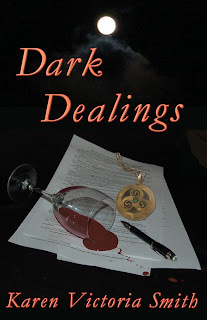 And as an added bonus, Karen is offering 1 free paperback or 2 free ecopies of Dark Dealings. Just go to the Indie Exchange in order to enter the draw. Jonathan Gould has asked me to talk about how my novel, Dark Dealings, differs from others on the genre. My vampires do not sparkle or walk around in the daylight. The world does not recognize their existence or the existence of shapeshifters and Druids with real power. No one lives in a remote swamp, where I think the food supply is more limited than in cities. I write urban fantasy based in a somewhat more traditional post-Nosferatu vein. Don’t get me wrong there is a strong romance element, but because my main character, Micaela, doesn’t get a Happily-Ever-After (HEA) it is not technically a paranormal romance. I had a small press publisher ask me to re-write the ending to make it a HEA, but this is just the beginning of Micaela’s journey and she is just not there yet. I also bring to Dark Dealings my own personal experiences. I was raised in an urban environment in an Irish Catholic family. We lived in a four-family apartment building where all four apartments were occupied by a family member or in-laws relative. My grandfather died when I was three leaving the building to my grandmother. She had been born in Athlone, Ireland and came to the United States just in time for the Great Depression. She was a great storyteller with a wicked sense of humor, and would tell me stories of her life in Ireland of family and fairy rings. She tried to teach me Irish, a skill I am still trying to master. And so I took my Irish city kid self to an Ivy League school and then to Wall Street. I spent 10 years there and then moved on to a major national bank when jumping on planes four days a week got very old. I learned a lot in those years about people, finance and, in writing and editing legal documents and board presentations about the power of choosing the right words. During that time the world went digital and 24-hour. One night, I sat with a glass of wine under a moonlit sky and it all came together. How easy it would be for the good old-fashioned vampire to hide and flourish in plain sight. As a Wall Street refugee, I realized that for much of the globe everywhere it was night it was day for a trading desk somewhere else. And while rich, powerful vampires lend themselves to more plot opportunities, the next time you stop in an all night deli or highway gas station wonder why some of these folks LIKE to work nights. Then Micaela started to speak to me. She was highly logical, analytical and rational. The classic Wall Street type. Too analytical, she was hiding something. She had a past and a history and demanded I tell it. What is it? Well you’ll have to read Dark Dealings to learn more. In writing Dark Dealings, I studied for years the craft of writing and for much of that time this novel was my homework project. Along the way, I discovered Joseph Campbell and The Hero with a Thousand Faces and his thematic progeny, Christopher Vogler, the man who changed Disney’s approach to films and has applied it to the novel. 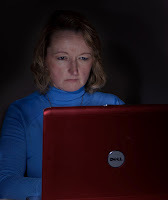 Perhaps one of the ways I am different from some of the fellow indie writers is that we are also the same. We are the sum and substance of our knowledge and experience. My experience has been a bit more eclectic than most and so I find is easier to meld Druids, vampires, shapeshifters and Wall Street into a great ride. I understand and cherish the power of the word and thanks to my Irish grandmother the power of a well-told story. Karen Victoria Smith grew up with an Irish grandmother who tried to teach her the old ways and watched horror movies with her in the dark. From there she moved on the wider world of college and career. After 25 years in financial services working on Wall Street and for major national banks, she discovered her passion in writing. In Dark Dealings, she has found a way to bring the old ways together with the modern world. Karen lives in New Jersey with her family who patiently allow her to believe that in a 24-hour world the monsters are real. Available in print through Amazon. And don’t forget – got to The Indie Exchange to enter the draw for a free copy.